From Here To Fame publishing have recently released the first title in their 'On The Run' Spring collection of books and features the work of South African artist Faith47. 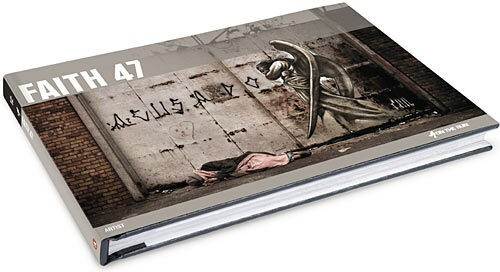 This from the publishers: Initially recognized for her unique graffiti and street artwork, Faith 47 is a self-taught artist who draws inspiration from her own intuitive political and existential questions. Her art takes on the form of metaphor. Both abstract and definitive in meaning, plucking at our heartstrings in harmonious and sometimes dark tones as she paints. 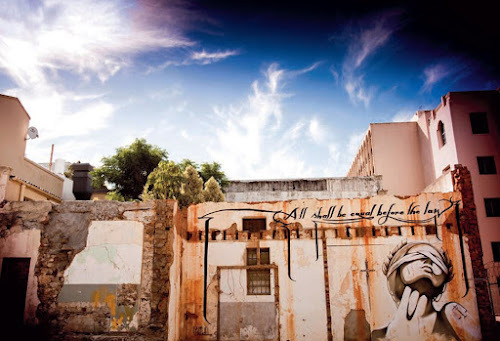 Faith's images thrive on broken-down cars and old factories, dusty side roads of lost towns and inner-city alleyways. Her deep affinity with lost spaces allows her to gracefully bring attention to the most honest and humble of environments. Her interactions resonate with our fragility and our elusive relationship with dreams, memory, human interaction and urban decay. Faith has established herself internationally, exhibiting her work in galleries and participating in projects across the globe. Despite this she remains rooted in South Africa, where the soil is red and her blood feels comfortably and peacefully on edge. The book is available online on the From Here To Fame Publishing's website in two editions, a paperback edition at EURO9.95 and a limited collector's edition at EURO14.95. It is also available from Amazon here.